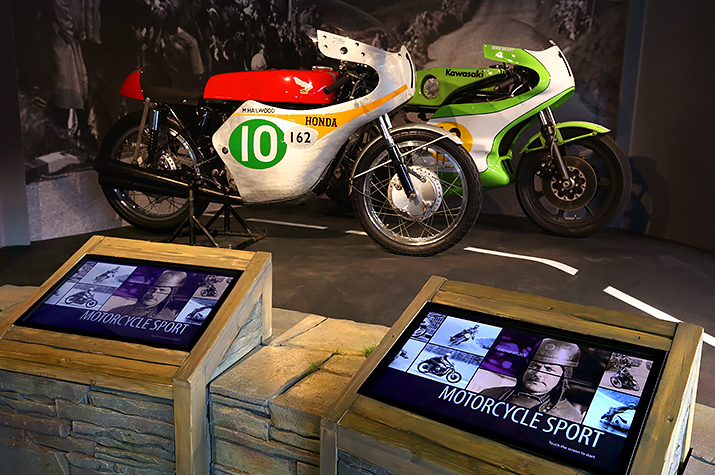 The Motorcycle Story gallery presents the motorcycle from the early days of motorsport through its life as a cultural icon in the 1950s and 60s. New interactives add layers of information and take the theming to another level. 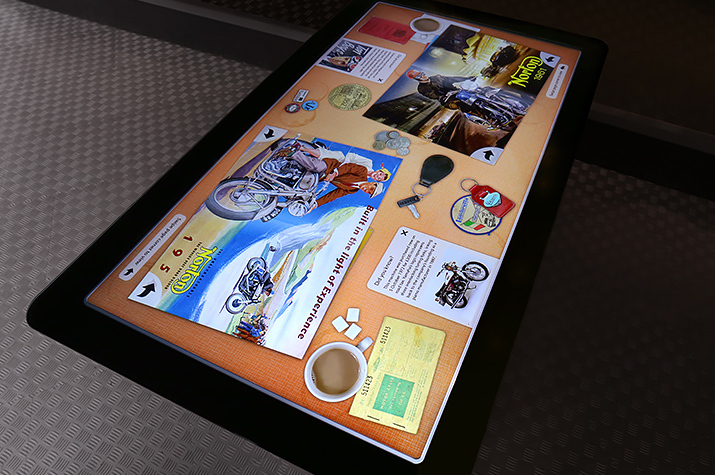 In the ‘Ace Café’, visitors can flip through magazines and play with artefacts on the digital ‘Formica’ multitouch table. 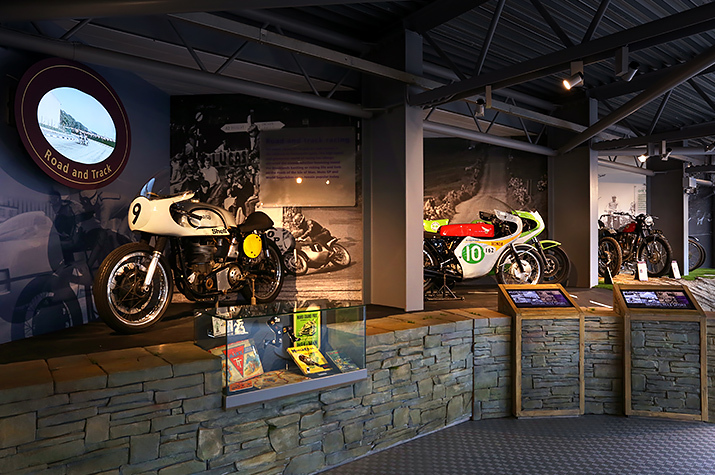 Multiple visitors can use the table at once to explore items such as badges and licenses to find out more about biker culture in the 1950s and 60s. 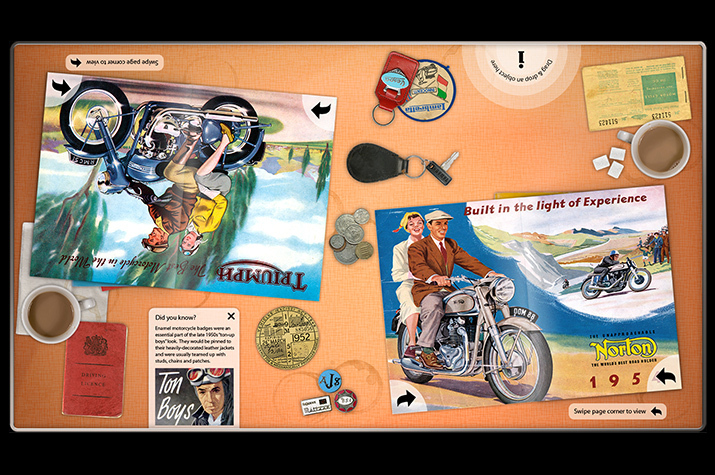 The design, by D J Willrich Ltd, takes the café theme, and extends it to the interactive touch table, making it a really fun way to explore the archival imagery. Elsewhere in the gallery, DJW is opening up archives of images and videos to visitors with new interactives. At each of the three interactives, visitors use a touch screen to choose areas of interest, and then to view archival material along with interpretation from the museum. In these interactives, DJW has developed an interactive framework for Beaulieu that can be very easily updated, and new material can be added as it is digitised, all by museum staff using familiar software. The interactives are the latest in a range of audio visual and multimedia initiatives that DJW has developed in conjunction with Beaulieu, continuing a long-standing relationship. The digital ‘Formica table’ has artefacts scattered over it, ready for visitors to play around with and explore. Touch screen interactives are built right into the exhibit theming, providing visitors with access to archive images as well as the objects around. A considerable quantity of archive images and footage is rendered accessible by the interactives.